See why St. Mark’s exists and where we’re going as a school built on Christ. We have a dedicated faculty who cares about the academic, physical, emotional, and spiritual well-being of your child. See the mind-building, faith-building, and fellowship-building events going on at our school. What are people saying about our school? St. Mark’s is a school that excels in every aspect of education and growth for children. There are many sports, exciting field trips, fun family events, and opportunities for students to learn to give. The teachers and staff are professional and dedicated, and the families all work together to make the school a great place for everyone. The teachers who coach the sports teams are excellent at guiding players’ skills and sportsmanship. The small class sizes and use of technology combined with excellent teaching practices provides a 21st century education, and prepares students for their high school years. At St. Mark’s, I know my son is receiving exceptional academics while learning sportsmanship, character development, and the Word of God. The facility is modern and wonderful. Educators are educated and experienced, and they partake in ongoing development. Leadership is positive, passionate and engaged. There is a focus on excellence and achieving your God given best in a truly uplifting environment. We love it here as part of the community, and we love knowing that the staff is as committed as we are to the whole development of the children. Coming into a Christian school, I / our family wasn’t pressured but rather encouraged with love to participate and never pushed. That feeling of inclusion without forcefulness is natural, welcoming and wonderful. St. Mark’s is a blessing to the community! 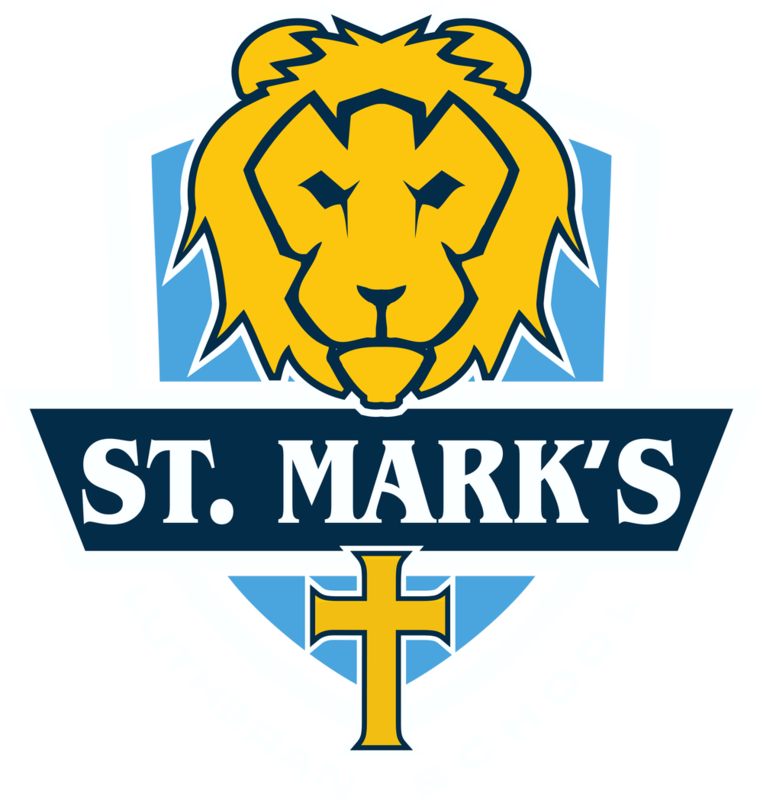 St. Mark’s is a friendly, welcoming environment where the priority is teaching with Christian standards and values in every subject. You don’t have to be a church member, or even a Lutheran, to attend. The teachers and staff make new students and parents feel welcome, and help them fit in. Our student was new in the fourth grade, and very shy, and her teacher and classmates were so helpful with her adjustment. There are also regular activities for all families that bring a high level of community to the school. The academic level of learning is high, and the classroom environment is geared toward teaching students to be self-motivated and organized. Technology is used to enhance learning regularly. Students are involved with sports, music, the arts, and drama, as well as a school newspaper and choir club; there is truly something for every student. The sports and physical education at St. Mark’s reflect a priority, and set the bar for excellence. The students regularly exercise, run, and play outdoors, as fitness is important at this school. There is an amazingly professional basketball program during the school year, as well as summer sport camps. The coaches are fantastic. As parents, we are so glad St. Mark’s goes up to 8th grade. The students coming out of here to go onto high school are well-balanced, healthy, confident, and joyful. I was so impressed both with the well-grounded foundation of the theology they taught and espoused and with the Biblical base and love of Christ which I saw so evidently in the teachers my kids had. It was a huge blessing. The most important thing that we as parents can pass on to our children is faith in God. In the end, nothing else really matters. My grandma was a member of St. Mark’s, and long ago I remember her telling me to “invest in what lasts. The only thing eternal is our faith.” I grew up in a family where God, faith, worship, and prayer came before everything, and I want to do the same for my children. I am thankful for the opportunity to send my children to the same elementary school I attended as a child where I know their faith and love for the Lord and others will only grow. On developing grit… This topic is central to the St. Mark’s culture. It is modeled by the faculty and reflected in St. Mark’s extra-curricular programs. Most notably, St. Mark’s uses its athletics program to model this. There are many opportunities presented on the field or on the court (or the stage or behind the mic!) that teach the students in ways that cannot be delivered as effectively in the classroom. We have had children at St. Mark’s Lutheran School for the past nine years. Our daughter graduated last year. She has transitioned great into high school. Not only was she academically ready (placed in many advanced classes), her faith is so strong. She is grounded in her beliefs. She has had wonderful teachers that have cared about her as a whole person. Many have come to cheer her on in extracurricular activities out in the community. My other two children are having the same experience. We are very happy with our St. Mark’s family. On developing honesty… St. Mark’s develops honesty, integrity, and fairness in several ways. First, the faculty models this behavior in an ongoing way. They are not (quite, ha!) perfect, but they model the behaviors and the students see these values lived every day. Second is the leadership structure, which holds faculty, students, and families accountable to a set of practices that support these values. Both of our children attend St. Mark’s and have since PreK. This year, our oldest will graduate from the 8th grade, so we’ve had a chance to see St. Mark’s at every grade level. The St. Mark’s difference lies with the faculty and the benefits of being in a Christian school. The entire faculty are not only top notch educators, but are Christian people who love and care about these children as God’s own creations. This means that hour by hour, day by day, the students not only receive a superior academic education, but also a life training and character modelling example. One of our sons played sports for a city league and at the end of the season was given an award for good conduct and being respectful to his coach and his teammates. We see this as a reflection of Christian values that are taught at St. Mark’s Lutheran School. Our sons have been at other religious schools and haven’t had the same experience as they have at St. Mark’s. A quality education, caring teachers and a safe environment. Our primary goal in sending our children to St. Mark’s was to provide a Christian education so they would know the Bible and have God’s Word as a strong foundation in life. It is already apparent, even in the two months since our daughter graduated, how strong a Christian foundation has been laid for her life. While there are many facets of the well-rounded education they received, at the heart of this is the willingness of the staff to partner with us as parents to constantly communicate, seek improvement, and listen to feedback over the years. St. Mark’s was instrumental in helping our family achieve a healthy balance of academics, music, athletics, and other extracurricular activities. The small class sizes allow students and teachers to get to know everyone. There are many great academic and spiritual opportunities. The teachers really care about students – both educationally and personally. There is an open door policy which allows parents to discuss problems as well as ideas for improvement. St. Mark’s Lutheran School is a tremendous blessing to my family. My child is receiving a balanced education permeated by Christian values. The teachers are dedicated and the atmosphere is nurturing and family-like. The excellent home-school communication strengthens our partnership in the education of my child. We enrolled our 4 year old in the Pre-K program after experiencing some problems at two other local schools. She was happy from day one and months later is still enjoying her school experience so much we plan to keep her there. As a public school teacher, with our class size threatened to be 30-40 students starting next year for all grades, I am quite motivated to keep my child where bully-behavior is not allowed and all students are known personally by the teachers! The teachers at this school take the time and energy to know the families and children. All the kids are pleasant to be around and appear to be happy. A quality Christian education that cannot be beat! My daughter’s experience has been wonderful in so many ways. The St. Mark’s staff has done a wonderful job both spiritually and educationally at all grade levels. I love this school. The academic level is high and there’s so much personal attention. We moved from a different state where my daughter was in the top public school in the county. When her former teachers heard what was being taught here, they were stunned. The curriculum is outstanding! But it is not just about academics here. Kids are well-rounded, from sports to arts to language. The family atmosphere is also encouraged: from older kids being chapel buddies for the younger, to having lunch together as a school family, kids are friends across the grades. And when there are discipline concerns, the teachers and principal address it in a Christian manner, lovingly and thoughtfully. Throughout everything, the love of Christ is shown. I wouldn’t want my children anywhere else. I have one child in 4th Grade who started at St. Marks in Kindergarten. No complaints here! I appreciate the well balanced education, including the usual math, science, history, spelling, but added to that a musical emphasis (piano lessons offered at school, mandatory choir), and of course a Christian emphasis in all activites. We believe very strongly in Christian education! The daily study of God’s Word and the use of God’s Word in every area of the curriculum including the discipline system is very important to us. The fact that our children are going to be prepared for life AND eternity is priceless. We have 3 children at St Mark’s, going on our 3rd year at this school. We came from a highly rated public school in our area and there is no comparison. St Mark’s is superior in every way. High standards, superior academics, moral and ethical education. We’re home. If you want a safe school with strong academics, a loving atmosphere, and a faith-based education, St. Mark’s is the way to go. I have two children enrolled and both of them as well as we love St. Mark’s. The teachers and staff are the best and truly care about the kids. For the first time in 3 years my son said, ” I like going to school.” I can not recommend St. Mark-s enough; it truly is a blessing.